In the early 1960s, shipping magnate Aristotle Onassis "discovered" the Greek island of Mykonos and brought Jackie Kennedy there -- and soon, the island became an exclusive playground for celebrities like Grace Kelly, Brigitte Bardot and members of the Versace family. Today, it's more democratic, a noisy, bustling, bursting-at-the-seams place with something for everyone, from singles to gay couples to families. You'll find quiet stretches of sand, party beaches, waterfront cafes, shopping in every price range (both international brands and local crafts), water sports and delicious food (especially fresh fish). 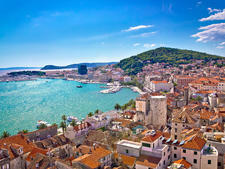 Scores of people, looking to experience the internationally renowned gold-tinged beaches and sweaty, pulsating nightlife, descend upon the tiny island during the packed high season, which lasts from the Greek Orthodox Easter celebration (usually in April or early May) through September. After the cruise season, Mykonos gets quieter, but it does not shut down. Restaurants in the principal tourist areas -- the beaches and waterfront -- are generally open from March until November. Spots where locals eat or where business is good year-round remain open. 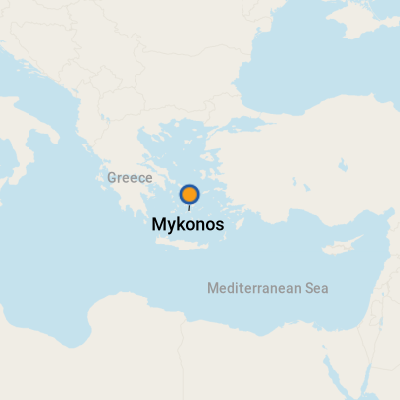 The largest town on the island is Mykonos town, also known as Chora or Hora; a few miles inland is the village of Ano Mera. The subject of many paintings by local artists, Mykonos is a feast for the eyes, with its azure waters, houses painted white with brightly colored shutters, bougainvillea trees in bloom, iconic windmills and colorful fishing boats. 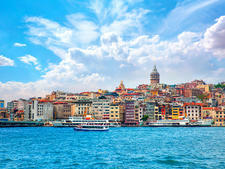 Visitors love to explore the shops, restaurants, cafes and churches on the narrow streets off the harbor. 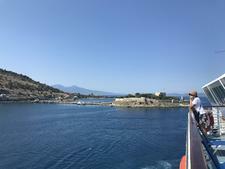 Cruise ships dock at the new port in Tourlos; however, when no space is available, they anchor in the harbor and tender passengers to the old port in Hora (known simply as the old port or the harbor). If you dock at Tourlos, you won't see anything beyond an ATM and a small canteen where you can buy water or soft drinks. Your cruise line will provide a shuttle to the edge of town. Other alternatives: the public bus (1.6 euros) or a water taxi (2 euros). If you're tendered to Hora, home to most of the ferries, you'll find a world of cafes, restaurants and shopping at your feet. (And you're within easy walking distance of the center of town and various highlights.) You'll also find tour operators there. There's not much to see at the Tourlos port, so you're better off taking the shuttle to town. If you're in the old port, there is plenty to do. Linger at one of the waterfront cafes over a frappe coffee, the popular Greek version of iced coffee that comes topped with foam. Maybe "Petros Pelican," the island mascot will show up, and you'll have a great photo op. Everything in town is walkable. Choose any of the winding streets (local legend says they were so designed to repel pirates) off the harbor and you'll find shops, restaurants and cafes everywhere. You can easily and comfortably spend hours shopping, snacking or dining (and checking email, as free Wi-Fi is available at many cafes and restaurants). ATVs and all kinds of two- and three-wheel vehicles speed around corners and up and down the narrow streets. This seems to be a chronic and serious problem, not only because ATVs are a popular way of getting around, but also because many deliveries to shops and restaurants are made by mini-trucks that travel the same streets used by pedestrians. On Foot: most of Hora's attractions are within easy walking distance -- no more than 10 or 15 minutes -- from the old port (harbor). From Tourlos, walking to town (about a half-hour) is possible but not recommended because there are no sidewalks, the terrain is not even and the road is quite busy in season. By Taxi: If you want to venture beyond the town, there is a taxi stand at Manto Mavrogenous Square (sometimes called Town Square or Taxi Square). It's marked with a bust of Manto Mavrogenous, the heroine of the 1821 War of Independence. Rates are fixed according to destination and vary by season. Phoning for a cab (22890/23700 or 22894/22400) is extra, also according to season (about 1.5 euros), and an appointment costs at least 5 euros. There are a limited number of taxis on the island so they may be difficult to get in high season. By Bus: There are two bus stations. The main Fabrica (also spelled Fabrika) in the southern section of town serves Ornos, Aghios, Ioannis, Platys Gialos, Psarou, Paranga and Paradise. The other, Fabrica, in the northern part of town, serves Ano Mera village and the beaches of Elia and Kalafatis. Normal fares are less than 2 euros. By Boat: Small boats (caiques) are one way to visit the beaches at the southern and western part of the island. Check the travel agencies at the old port for schedules, departure points and fares. The euro is the official currency. For updated currency-conversion figures, visit www.oanda.com or www.xe.com. ATMs are scattered throughout town and can be the cheapest and easiest way to get money. Most shops and restaurants accept major credit cards. However, as one local said, "Cash is king." That means you may do better offering cash to strike a bargain. There are several bank offices in Hora, open 8 a.m. to 2:30 p.m. weekdays and until 2 p.m. Fridays. A passport is needed when changing money. Greek is the official language, although English is widely spoken, as are some European languages. Locals will appreciate a "YAH soo" (hello), "ef-hah-rees-TOH" (thank you) -- and any other phrases you can pick up prior to your cruise. Greek cuisine reflects its long history, with flavors that are Levantine, Turkish, Italian and Balkan. Though you'll find examples of many cuisines on Mykonos, from Chinese to Italian to French, your best bet will be the local Greek specialties. Most of the restaurants in the harbor area serve breakfast, lunch and dinner. Many stay open very late. Souvenir shops are full of trinkets and postcards with a windmill theme. Leather items -- handmade sandals, tote bags and backpacks -- also are popular. So are the flowing white cotton dresses and shirts that are so appropriate for the island setting. Jewelry at all prices glitters in shops windows, from the expensive 18-karat gold pieces at high-end shops to budget-friendly but stylish items (many starting at around 7 euros). For unique pieces, Sur Real (P. Drakopoulou 1), a few steps off the waterfront has handcrafted leather jewelry: necklaces, belts, bracelets and rings. The bracelets, which are the most popular items, are set with various stones (or watches) and start around 50 euros. Shops usually open from 10 a.m. until late night; many close for a couple of hours around 2 p.m. When cruise ships are present, some shops stay open all day. Bartenders island-wide will make anything you want, but if you want to drink like a Greek, stick to ouzo or the local brew, Mythos, which is good -- and cheap, at just a few dollars for a hefty draft.